Born in 1936 in rural Georgia, raised on a plantation, McCloud attended Boggs Academy and Warren Wilson College before graduating in sociology from Berea College. While pursuing a master's in divinity from Union Theological Seminary in New York, McCloud helped found the Student Interracial Ministry to support the student activists holding sit-ins in the South. After graduating in 1961, McCloud continued his work in civil rights, first as pastor of Davie Street United Presbyterian Church in Raleigh, N.C., and then on the staff of the United Presbyterian Church in the U.S.A. Commission on Religion and Race. 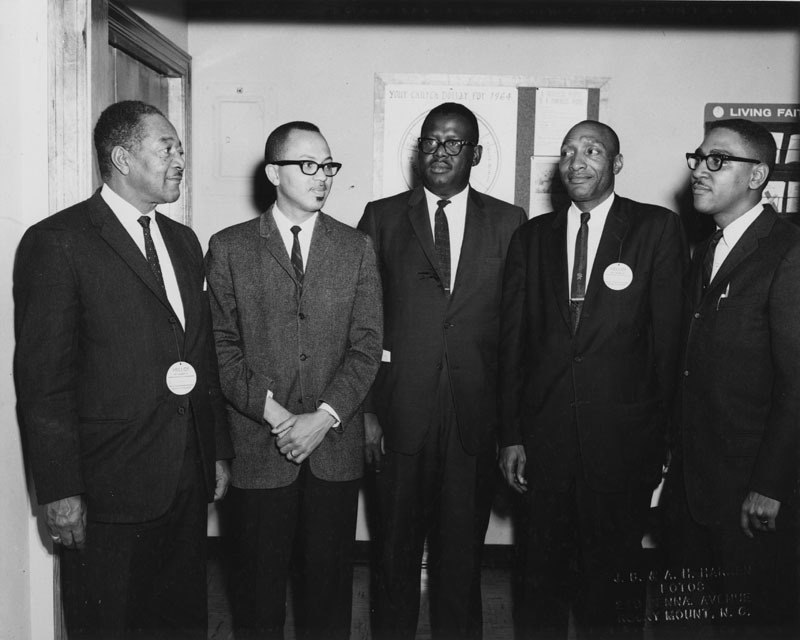 Left to right (all pastors, Cape Fear and Yadkin Presbyteries, UPCUSA, early 1960s) Benjamin Baskerville, Wilmington, N.C.; J. Oscar McCloud, Raleigh N.C.; James H. Costen, Rocky Mount, N.C.; Grover D. Nelson, Laurinburg, N.C.; James Allen, Wilson, N.C.
As general director of the Program Agency from 1972, McCloud was among the first Presbyterians to make official visits to South Africa, Cuba, Czechoslovakia, Poland, and East Germany. The papers include his accounts of visiting Cuba in 1977 and Cameroon in 1980. Over the course of his long career, McCloud has represented the Presbyterian Church at the National Council of Churches and the World Council of Churches, has been director of the Fund for Theological Education, and has served as moderator of the Committee on the Office of the General Assembly. He is pastor emeritus of Fifth Avenue Presbyterian Church in New York, and is a staunch advocate and friend of the Society. Thank you, Rev. McCloud!